The skills of a particular trade help you develop the technician within; if you spend 3 years at a technical school learning the trade of becoming an Electrician, then you hope to get a job working for a business that offers those skills – that schooling does not prepare you to run a business that offers electric repairs and installation. Entrepreneurs start facing challenges when they confuse their Technical Skill with the Running of a Business that offers those Technical Skills. Being a good Real Estate Agent with the skills of helping Buyers and Sellers does not automatically graduate one to running a Real Estate Brokerage. 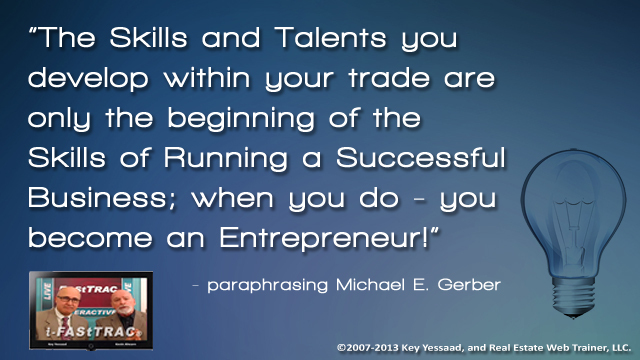 You must bring a Business Mindset to your Business and expand your skills past your trade technical skills.